This year London College of Communication’s Design School harnesses the opportunity of the London Design Festival to host Everything Happens So Much – a programme of shows, events, performances, installations and debates which respond to the themes of the School’s new manifesto. The exhibition becomes a platform to celebrate the work of students and staff and to gather ideas, responses and different perspectives on the state of design. The Design School invites visitors to explore our galleries and the spaces between; immerse yourself in open processes, research and experiments that respond to the current condition of intense activity and accelerated change where ‘Everything Happens So Much’. What can visitors expect from Everything Happens So Much? Visitors can expect to be engaged by a variety of stimulating shows, activities, performances and talks. We hope to give people a sense of the scope of our teaching, research and practice and how we see our role as educators in terms of the wider civic, social and ethical responsibilities that we share. What kind of work will be on show, and what kind of activities can people get involved with? 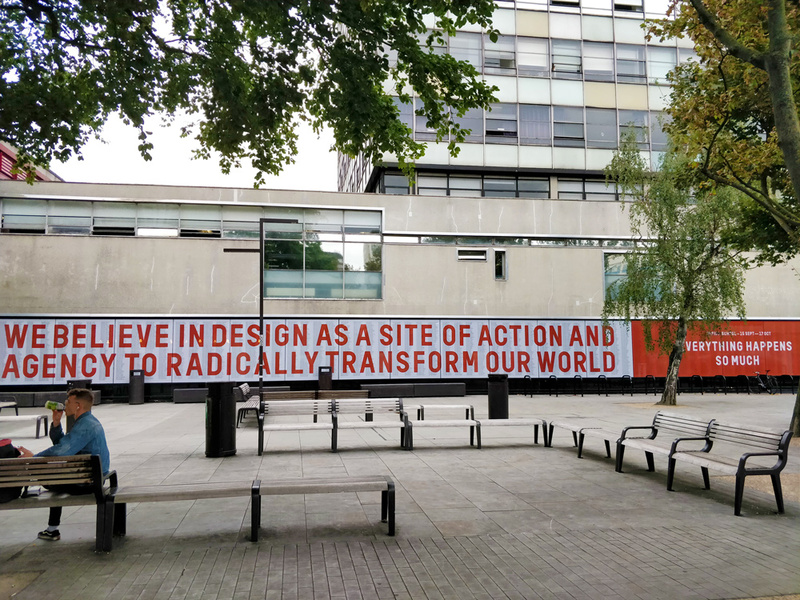 We are launching a new Design School manifesto which will be displayed throughout the exhibition with a main focus on the Manifesto Wall in the lobby. We want visitors to participate in the making and re-making of our manifesto by giving us their own perspectives on the 8 statements we have collectively produced as a School. Opportunities to do this will happen in a number of ways through student led interactions and an open invitation to write responses and post these in our manifesto ballot box. More broadly Everything Happens So much is comprised of a number of shows which each offer events and activities in which visitors can take part. There are films, posters, sculptures, installations, documentation of process and a range of publications to enjoy. We want people to be entertained but most importantly to be challenged and to question the role of design and designers in the context of a turbulent world. The name of the show comes from Horse e-Books: a Twitter spam account that spat out fragments of modified text, including the title. Supposedly created as a bot to promote electronic books, the account was later revealed to be human-run, uncovering the human intent behind the unruly system. The name for the overall show was proposed by Dr Georgina Voss, Supra Systems Studio Lead. Service design as part of London Design Festival. Sarah Weir, Chief Executive of the Design Council, will be giving the keynote talk for the show. Why do you think Sarah is the perfect fit for this? I invited Sarah to give the keynote talk for 2 key reasons. The first is because the Design Council has just published an important new report called ‘The Design Economy 2018; the state of design in the UK’ which considers the value of design and makes recommendations for improvements. Secondly because she is the first female CEO of the Design Council and a powerful advocate and role model for design, a sector with a workforce that remains 78% male. I will be discussing the findings of the report with Sarah and considering ways in which we can address the diversity challenge which design continues to face. Supra Systems Studio are using the show as an opportunity to officially launch. Could you give us a brief introduction of the research platform, and a hint of what people might expect from the performances and outputs? As a Design School, we are very excited to be launching the first of a number of new research platforms. 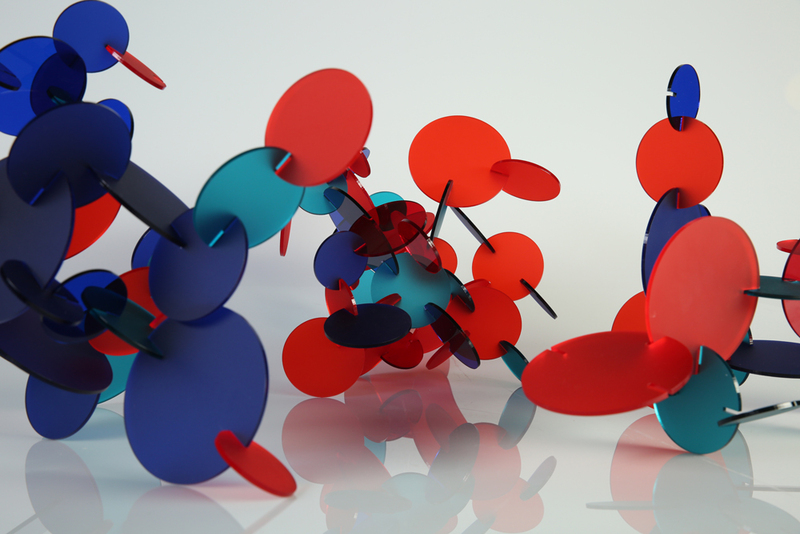 Supra Systems Studio is comprised of a community of academics, practitioners and students interested in the politics of network technologies, Artificial Intelligence and machine learning. SSS is located within the Design School but works across institutions and geographies to explore and critically engage with complex emergent technologies and systems through design and art practice. As large-scale technological systems become embedded and unrolled without critique, there is an urgent need to open up discussion and question the long-term implications of these developments. The launch will include a series of performances around concepts of the body in virtual reality, notions of data and predictions, agency and algorithms. There will be related activities at the V&A for their Digital Design weekend, an exhibition in the Shopping Centre and symposium and book launch. What is ‘beyond human centric’? This phrase is used in the manifesto statement: ‘We believe that design operates in an ecology beyond the human centric’. Our intention was to emphasise that design should not only be informed by human needs but must recognise the wider impact of design decisions on nature and the planet. It responds to ideas about a shift from an ‘ego-logical’ society to an ‘eco-logical’ society, the latter being more democratic, holistic, sustainable, compassionate, natural, balanced and interdependent. It is about taking into consideration the long-term implications of design decisions through understanding individual needs within the context of our broader societal responsibilities. It speaks to a systems approach that acknowledges both the direct and collateral consequences of all that we do as designers. How do you see the state of design right now, and how do you think the Design School at LCC can impact and affect it? That is a big question! My initial response would be to say that design continues to be in a period of significant transition, which as a university presents us with huge opportunities. On the one hand the contribution of design to the economy is increasingly valued by industry due to the centrality of design and design skills to the fourth industrial revolution. This is clearly highlighted by the Design Council’s recent report which emphasises the role of design in innovation and its positive impact on long-term productivity and local and regional economies. However, there is a major challenge around diversity in relation to ethnicity and gender and also in ensuring that we can meet the increasing demand for designers within the context of reduced design and technology provision in schools. Design as a discipline is becoming increasingly hybrid and media agnostic and it is our responsibility as educators to ensure that our students exit university with the appropriate skills and experience. We are a Design School staffed by colleagues who are passionate about design and what it can do and we believe that nurturing critical awareness and contextual understanding alongside creative experimentation is crucial. Everything we do should be understood against the back drop of the long-term challenges we all face – climate change, political instability, economic inequality, demographic shifts, increasing automation and the erosion of privacy and security. To create meaningful change you need to recognise the urgency of the above and reframe everything you design within that context. Why is the Design School launching a new manifesto, and why now? As design has become increasingly networked, global, multidisciplinary, media agnostic, critical and socially engaged, it was crucial for us to review our course portfolio to ensure it was responsive to external needs, sustainable, resilient and flexible. Having undertaken a complete portfolio review and a realignment of our Programmes (departments), it seemed an appropriate moment to develop a new School Manifesto. We wanted it to align with the College Vision with its emphasis on experimentation, collaboration and challenging the status quo but also to express the unique beliefs and ethos of the School. 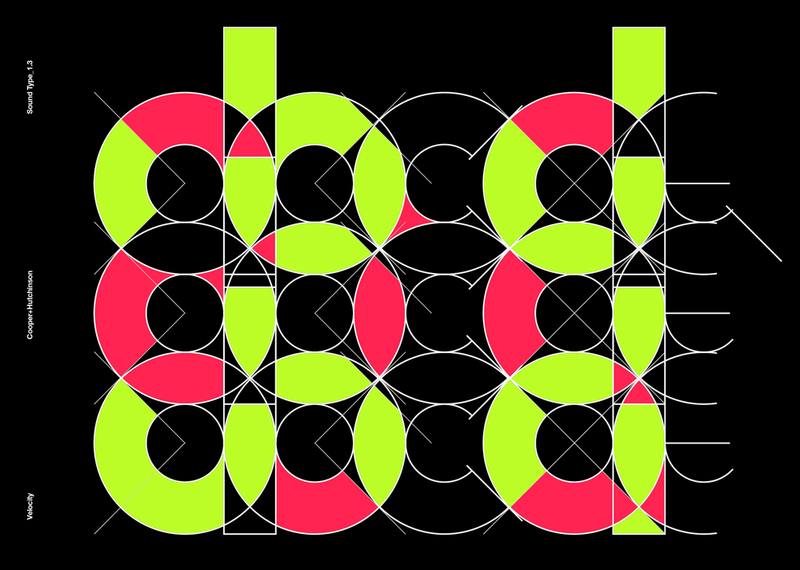 The Design School Manifesto is intended to be a dynamic document which is always in process and never closed. We replaced the previous Design School vision statement as it did not adequately represent the distinctiveness of the School and the commitment of academic colleagues to students, subject and society. 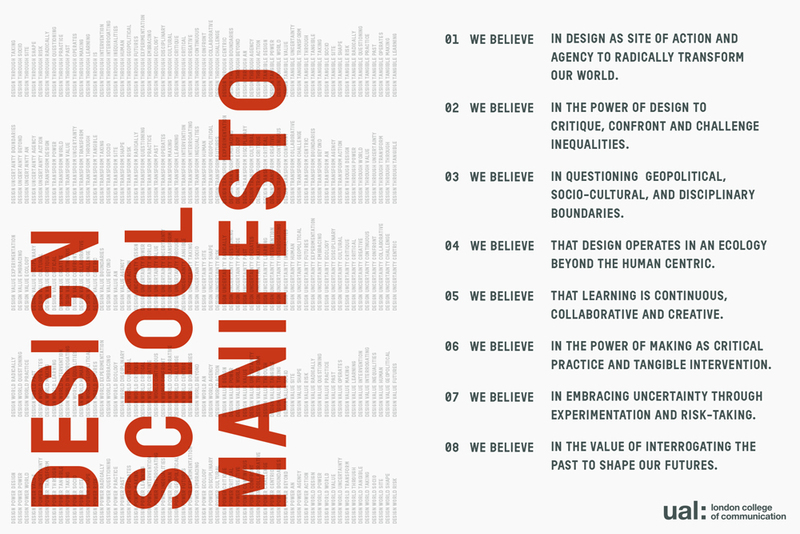 The new Manifesto was written by staff across the School through collaborative document editing and the current iteration is a distillation of beliefs which map into the key areas of research and pedagogy that underpin Design School portfolio developments. We want it to be a work in progress/ flux that is always contingent and open to critique, contestation and debate. Finally, what do you hope visitors who explore the exhibition or take part in the events take away from their experience? I hope that visitors will take away an understanding of what we do as a Design School: the issues we struggle with, the failures we learn from, the opportunities we embrace, the pleasures we bring, the problems we solve and the questions we raise. Most of all I hope they will see the potential that a university education in design offers and how it can enhance not only the lives of our students but also the wider communities and environments they work within. Everything Happens So Much runs from 15 September to 17 October 2018 – with a number of exhibitions and series of events, discussions, workshops as part of it. Find out about the Design School at London College of Communication. Learn more about Uncertainty Playground, last year’s exhibition as part of London Design Festival. Check out upcoming events at London College of Communication.